5 Minutes for Books, a regular column of 5 Minutes for Moms has done it again! If you have never stopped by and read these reviews, you are missing out! 5 Minutes for Books gives you an "inside peek" at some really great reads for you and your kids! This week, Jennifer shares about a series of books written by Lori Z. Scott, the Meghan Rose Early Readers. Stop by 5 Minutes for Moms today; grab your entry for a chance to win one of these great books for your kids! 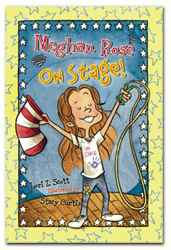 The author has donated three copies of Meghan Rose On Stage! to be sent to winners in the U.S. or Canada; however if there are at least 30 people who comment on 5 Minutes for Books blog, she will send out five copies, and if there are over 100, she’ll give away seven copies! So, spread the word! You NEED to comment at 5 Minutes for Books to be eligible to win! For more info, check out the really great website for the series which has jokes, links, and parent/teacher activities, as well as information about the next two books in the series, which are coming soon.